Microsoft on Wednesday released its seventh version of Windows 10's technical preview. Build 10061 was the first update in April and followed its predecessor by about three weeks. Last month, Microsoft vowed to pick up the pace of Windows 10 preview updates, and since then has delivered three, including Wednesday's. According to Gabriel Aul, the engineering general manager for Microsoft's operating system group, Build 10061 features new Mail and Calendar apps, which support Exchange, Gmail, Office 365, Outlook.com and other account types. It also includes improvements to the Start menu and taskbar visuals; enhancements to Continuum, the technology that automatically switches 2-in-1 screen formatting when the tablet part of the device is disengaged from the keyboard; and unlimited Virtual Desktops. The latter is an organizational feature similar to OS X's Mission Control, formerly dubbed Spaces. Build 10061 also illustrated, perhaps better than any previous versions, the rough edges that Microsoft is now willing to show customers as it implements a new development and release system. Several bugs, including some that would certainly have been showstoppers in the past, were allowed to remain in Wednesday's build, including one that even Microsoft found absurd. "The version of the Mail and Calendar apps included in this build have a known issue that causes every typed letter to appear twice … which might be funny if it weren’t so irritating," acknowledged Aul. He directed users to the beta of the Windows Store -- Microsoft's official app distribution mart -- to download updated editions of the two apps, which contain fixes for the character doubling. The apps will also begin updating automatically 15 minutes after the user logs onto the device for the first time, Aul added. Another bug was almost as odd, but had no immediate fix. "We know this one will be a bit painful but there is a bug with this build in which Win32 (desktop) apps won't launch from the Start menu," Aul admitted. "The workaround is to use search to find and launch these apps and pin them to your taskbar for quick access." Some analysts see the Windows 10 Technical Preview as a rehearsal for its plan to regularly update the operating system after its official launch this summer. If that's the case, Microsoft hasn't released enough builds to clearly demonstrate that it can, in fact, maintain the monthly pace it alluded to last year. 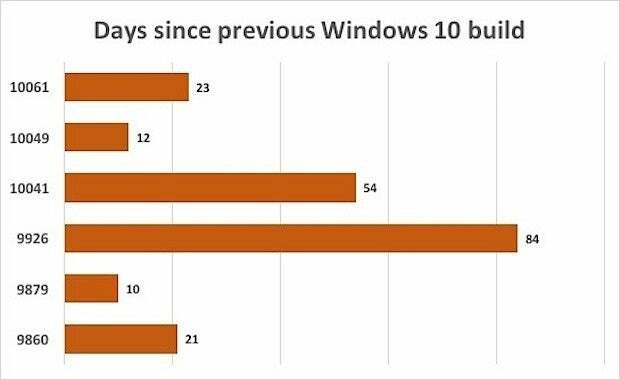 The last two builds, however, have given outsiders the first hint that Microsoft can make good: Changes appeared just 12 days (build 10049) and 23 days (build 10061) after the preceding refresh, for an average interval of 17.5 days. Build 10061 can be downloaded via Windows Update on Windows 10 devices that have been set to the faster of the two "rings," or update tracks. Microsoft may issue another update next week during its Build developers conference. The company has not changed Windows 10's wide launch window of "this summer," but last week AMD's CEO pegged it to late July. Microsoft has declined to comment on that date. Windows 10's preview update pace remains uneven, but the last two builds hint that Microsoft can, in fact, deliver updates on a faster-than-monthly schedule.